Intended for photographers who desire wireless shooting, the Indra360 TTL Studio Light with Battery from Phottix offers a design driven by portability, flexibility and power. This light is able to remain sync cord-free, and therefore hassle-free, thanks to the Odin receivers for Nikon and Canon cameras built-into every unit. And using the included 4,000 mAh rechargeable battery pack, shooters can eliminate the need for the AC cable while getting up to 300 full-power flashes. Phottix starts with a flash head with all the qualities of a studio flash such as 360Ws of power, adjustable from 1/128 to full-power over an 8-stop range. Recycling time is 2 seconds at full-power with the included Li-ion battery and 0.1 - 1 second with the optional AC adapter. Action-stopping flash durations are possible at reduced power settings for freezing splashes or peak-moment sports shots. The light can be triggered at distances up to 328' thanks to built-in Phottix Odin radio receivers for Nikon and Canon cameras and use of the optional Odin 4 channel transmitter or a Mitros+ flash unit. 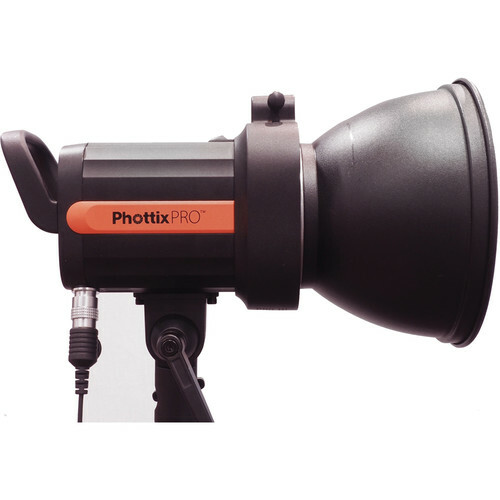 This would be an impressive flash head if Phottix had just stopped there but the Indra360 is also TTL capable with Nikon and Canon cameras, giving photographers seamless exposure transition in rapidly changing light conditions using their camera's auto-exposure technology. Using the optional transmitter, TTL power can be adjusted remotely +/- 3 EV, while manual mode has an expanded 8-stop range. The Indra360 TTL ships with an umbrella-type reflector with a Bowens mount. Other accessories such as a snoot are available. The Indra360 can also use other brands of light shapers that have the Bowens mount. Recycle Time With optional AC adapter: 0.1 - 1.0 sec. With included battery: 0.1 - 2.0 sec. Max Sync Speed Up to 1/8,000 sec. Box Dimensions (LxWxH) 17.3 x 14.8 x 10.3"
Indra360 TTL Studio Light is rated 5.0 out of 5 by 7. Rated 5 out of 5 by Carlos from LOVE IT!!! I heard so many mixed reviews about this light and decided to give it a shot. I'm so glad I did. This light is AMAZING!! It performed great and the TTl was spot on. Sure there were little adjustments made, but the final images were just beautiful. I would definitely recommend this light 100%. I used it for an outdoor wedding and it was strong enough to over power the sun and the small battery had me a bit worried about holding enough juice for the entire day but it did! If you're thinking about getting it, don't and just get it! Rated 5 out of 5 by brad from Game Changer Having the ability to use HSS in a portable unit with this kind of power has changed the game. You can now use your fast primes and shoot wide open AND augment the existing light. That is what this does. Sure it's TTL, but TTL is still hindered by its own failings...it just doesnt work when metering brightly lit scenes, or when it sees a very dark scene. Manual is the way to go so you KNOW absolutely how much light is being output every shot. The battery life is quite good, even on this smaller battery. The bag that come with this kit was a nice bonus too.....Built in trigger/receiver options also simplify the day....NICE WORK, now please fix the Mitros+'s couple of issues (overheating, shutting down, flash tube failures) and you'll have quite a set up for sure. Rated 5 out of 5 by Mike from Very Happy! I do Boudoir portraiture in the client's homes, or in a location of their choosing, after 20 years of shooting in a storefront studio, followed by a home based studio. I have been downsizing ever since. I have been using the Phottix Mitros flashes along with my Nikon SB 910 and Odin 2 trigger with great results for portable lighting. I love being able to control everything in small increments with the Odin Transmitter on my Nikon D810. But, I wanted something with a little more ooomph and a modeling light too. The Indra 360 is what I was looking for. It does what I need it to do, is pretty compact and I dig the carry case too. In the studio I had always used White Lighting Ultras. The Indra 360 is smaller and lighter, and easier to travel with than the White Lightnings. I rarely use it on full power, so the battery charge lasts pretty well. If I ever start doing studio work again, I will purchase more of these. It's sturdy and seems very well-built. Happy Photographer! Rated 5 out of 5 by Neal from everything I wanted awesome product with plenty of power even when firing outdoors. recycle is a little slower than expected after a full power flash. Rated 5 out of 5 by Nurit R. from Great Studio & on Location Light Great design with a very small but powerful rechargeable battery that has both Canon and Nikon transmitter incorporated in the body. Works with Phottix Mitros + or Odin. Amazing Value for your $$$! Rated 5 out of 5 by Michywatchao from Estoy muy satisfecho con los resultados de este equipo La calidad de salida es muy consistente, HSS una gran ventaja. Excelente opcin de valor ante el Profoto B! o B2. Rated 5 out of 5 by Karen C. from Just what I've been looking for I've been searching for a TTL portrait lighting solution and I'm so glad I came across these. I've been using the Nikon commander and Nikon TTL flash units but really missed the modeling light I had in my old lighting system. I do a lot of location portraits and I'm really looking forward to testing these in all kinds of scenarios. I've only done a test run so far and very impressed. Does this ship with the same case as the Indra 500? Is there any way to buy a spare battery for the 360, I haven't seen them for sale anywhere? I use Sony A7, Phottix Mitros+ for Sony, and Phottix Odi TTL receiver for Sony. Can I connect them with Phottix Indra360 TTL? At this absolute moment, the Indra firmware is not compatible with Sony. But good news is on the way. I just received a pre-production Odin II for Sony which we will be showing at WPPI. Frimware upgrades for Indra and Mitros+ are in the works and available soon. This is going to be a very good year for Phottix and Sony. It looks like you are most of the way there. Could the pairing be used today? Yes, if you set the Indra for Strato II receiver. The Odin channels and groups can be used but power must be set on the flash. Down the line (perhaps. April..I don't have a hard date yet), you can upgrade the firmware for full Odin II and Sony operation. BTW, Thanks for choosing Phottix. Stay tuned. Big things are coming. Will the 360 small battery work with the Indra 500? yes you can do hss using manual power. BUT to do so, you have the setting on the light itself set to ttl. On the odin or the mitros+, is where you designate manual power if you want the ability to remotely control said manual power, and or use HSS. If you just set the indra to Manual....its just like every other dumb , in that you have to adjust via the back of the unit itself. Can you connect to AC power and use it while being charged? No; the outlet for charging is covered when the control half and battery half are connected. I have read that some of the new flash system the battery has to stay charged. Some people went 2 weeks without re-charging and had to replace them. What about theses batteries? What is the battery life with the modeling light on? If you are just using the flash with a fully charged battery, you will get about 300 shots. If the modeling light were to be used, you would get about 10-15% less, but that amount will vary with the interval between flashes if the light remains on during those dead times.